From Slovakia we ventured east to the Hungarian capital; Budapest. Befoore arriving I knew Hungary had a craft beer scene, mostly centred around Budapest, and so I was particularly keen to sample some of the local wares. Before heading into the Hungarian craft beer scene we did some sightseeing and had lunch beside the St Stephen's Basilica. I accompanied my Goulash with a Dreher, the Hungarian national lager and the beer that was reviewed on Beer O'Clock Australia as Hungary's representative in the European Beer Challenge. It's as I remembered it; a sweetish lager with reasonable hop bite. I do however feel the "honey malt" may have been a by-product of poor storage/shipping conditions... I got idea what else it could be! A trip to Csak a jó sör was my first beer related stop. For Melburnites it's along similar lines as Slowbeer, primarily a bottle shop with a few taps. The beer range was excellent with heaps of Hungarian, American and a few other countries well represented. BrewDog from Scotland was particularly well represented with quite a few varieties I'd never even heard of before. Naturally I had a beer while perusing the range, which was not laid out in any pattern I could work out. The beer was Happy Finish from armando_otchoa, a "semi-dark Hefeweizen" which looked cool but tasted like a regulation Hefeweizen. The service was a little odd though, I asked the guy in the shop about a few things about the Hungarian beer scene, best beer, brewery with best reputation etc. and all he'd give me was they're all good... Not quite what I was after but I still walked away with 9 Hungarian craft beers to sample back at the room. Whilst at Csak a jó sör I also polished off the second half of Lizzie's choice, a particularly bland Hungarian craft beer called Jozin Z Bazin. After that we went on a walk down Andrassy Utca, the main shopping street, where Lizzie bought clothes like you wouldn't believe! Shortly thereafter we decided it was too hot and made our way back into the back streets and the comforty surrounds of Lehuto. Lehuto was a craft beer bar/pub, with a huge outdoors area in the sidestreet and a cozy bar downstairs which would seat maybe 30-40 people at a stretch. They serve predominantly local craft beer and American style Hot Dogs. My first beer there was actually Slovakian; and even more surprising it was excellent! Kaltenecker Suzuki IPL was the beer and it had a really odd combination of hops. Still it tasted fantastic and gave me that furry tongue feeling that I haven't experienced since I left home! Funny that I had to go outside Slovakia to find my favourite Slovak beer! 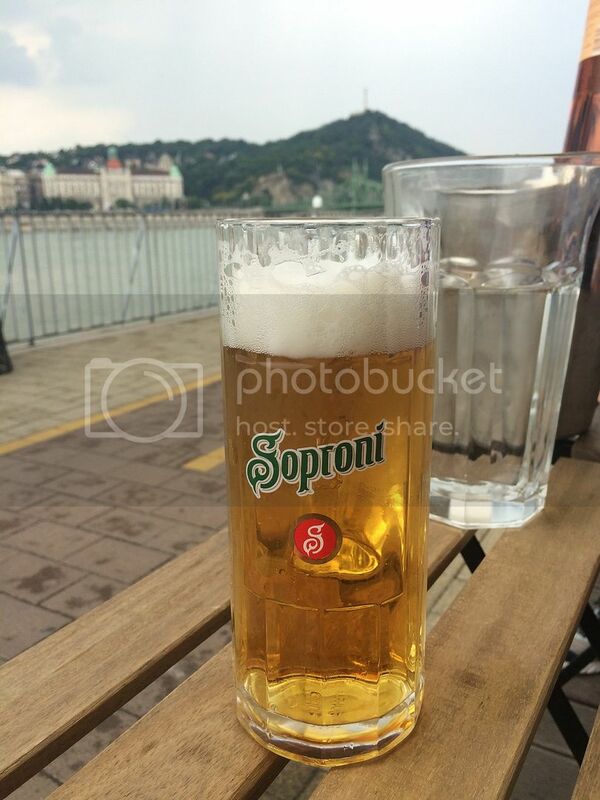 Borsodi is another of the macro Hungarian lagers. 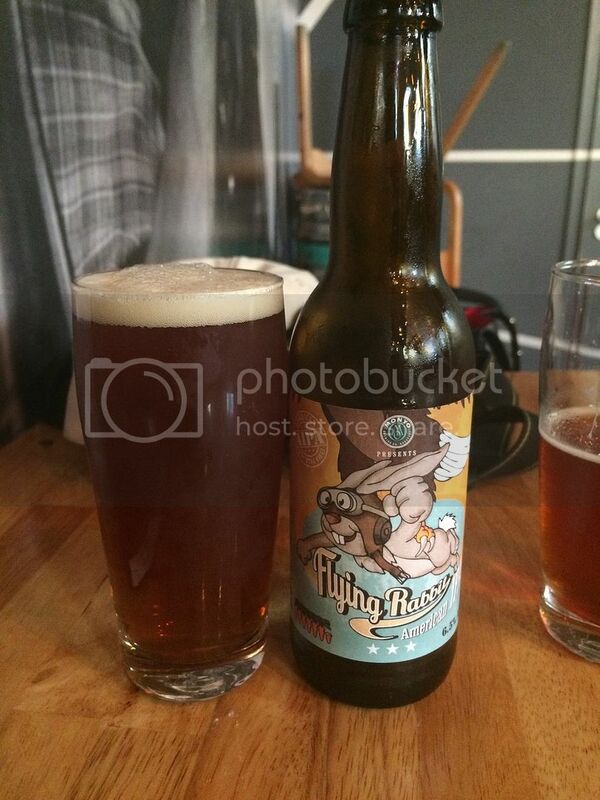 It seems to be in the more hipster restaurants and areas and was perfectly drinkable if nothing special. Hopfanatic's American Pale Ale was next and like the Kaltenecker IPL, the hops were odd, however it was a really enjoyable Pale Ale. It's something that would sell well if it made it to Australia, although I don't think any Hungarian craft brewery has the size to think about exporting. After a wonderful Budapest tour the next day we stopped in for Italian at Pomo D'oro new the Hungarian Parliament. They had a range of Italian beers that I'd never heard of before; from Labi. Still somewhat missing hops I went with their IPA - La Ambrata. The whole range is beautifully presented in 750ml bottles and the beer was also well crafted. It was packed full of grapefruit flavours and had excellent bitterness. A beer drinking cruise on the Danube followed with almost as manyy Dreher's passing through my lips as bridges we went under (hint: there's a lot of bridges in Budapest). Before retiring to the apartment for the evening and trying a couple more of the bottles I'd bought. Vari Novorek, a collaboration between Szent Andras and armando-otchoa, was a nice easy drinking Pale Ale with good fruitiness. The hops they use here are unlike ones I'm used to and I was getting a lot of peach in this beer. My third beer from Hopfanatic was their Nohoplimit Imperial IPA. Again the hops were odd but tasty, providing excellent bitterness but this unusual berry flavour. The label later pointed me in the direction of elderberries... 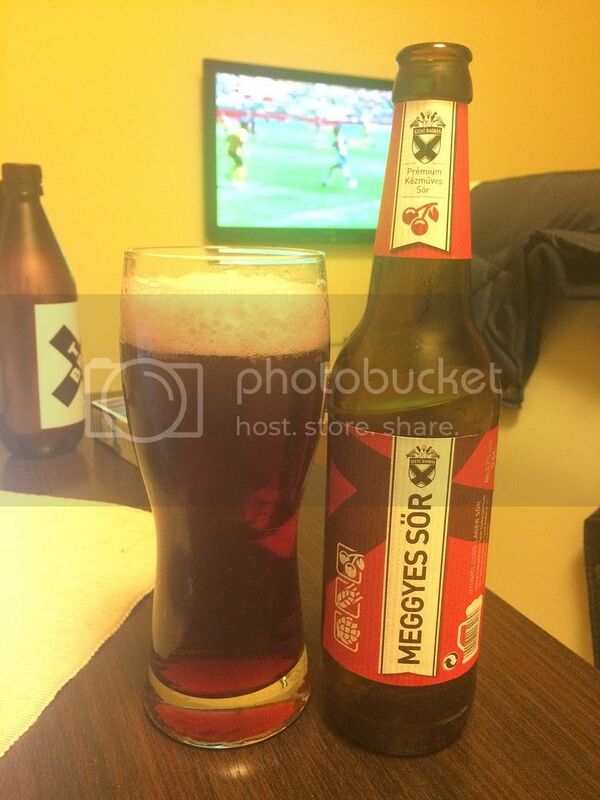 While my second beer from Szent Andras was a fruit beer called Meggyes Sor. It was a really interesting beer which managed to showcase the sweetness and sourness of cherries at the same time. I haven't quite explained that correctly as the flavour was definitely that of sour cherries, yet the overall feeling was sweet (hopefully that makes sense!). Anyway if it doesn't, go to Budapest and try one! At lunch the next day I had a Soproni, again a sort of sweetish lager that wasn't particularly inspired but also wasn't bad. After some shopping Lizzie and I popped back into Lehuto for a couple of beer. Golem Sotet Bunko was a lovely roasty Hungarian Black IPA while at the other end of the spectrum the Aprily Stanley American Pale Ale was very poor pale ale missing all hop flavour. 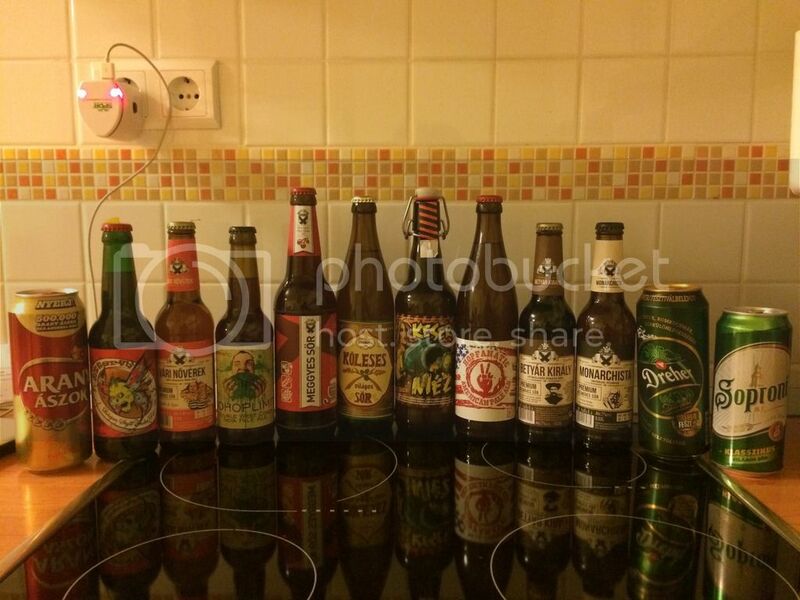 Dad and I knocked through the remaining beers on our last night as we had no way to carry them to France. The standout was Keseru Mez, a lager with grassy hops and a bubblegum flavour towards the backend, with some pretty cool label art to boot. Bitterfly from Hopfanatic was a nice bitter Belgian IPA, will Szent Andras' Betyar Kiraly had an odd licorice flavour and wasn't particularly easy to drink. 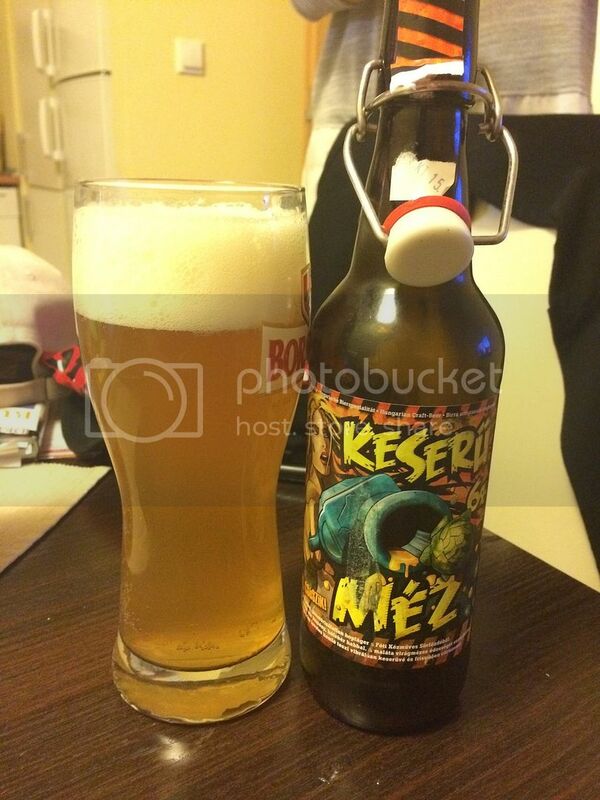 Koleses Sor is a beer made with Millet as part (or all?) of the grain bill. Basically what resulted was a beer that was far too sweet and had this odd, almost wine-like, feel at different times. Szent Andras' Manarchista was the last of the craft beers that we tried. It was an interesting Imperial Pilsner with hops that were spicy, almost peppery. It's not something I'd drink heaps of but I'd like to try it again. We finished by sampling 3 of the macro lagers in can-form that we could get across the street at the 24hr Bottle Shop. Arany Aszok was a pleasant easy drinking lager. Dreher was also easy drinking with a little more malt base than the Aszok. Whiilst Soproni was just a little bit too sweet for me. Hungary was awesome! Budapest is an amazing city that I hope to return to. They produce alot of craft beer but on the whole it isn't that good with a few exceptions. This is a country with a relatively young craft beer scene and this can only improve. If you're looking for a slightly left field craft beer destination in Europe, I wouldn't hesitate in recommending you to visit Hungary. After all fine post.Really enjoyed reading it from first to last and I am interest for your next post and you have any time please check you will get more related topcs gym singlets.